This game centers around a child defending their bedroom from monsters that appear in the night. 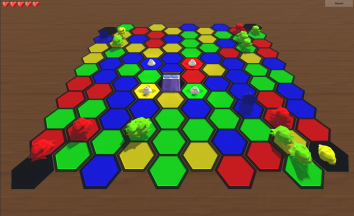 The player must click colored tiles to direct monsters to turreted locations on the game area, where toys will destroy the monsters and not allow them to reach the child's bed. We all associated "Home" with childhood, and created a game based on that idea. "Let Me Sleep" comes from both the child wishing their nightmares would go away so they can sleep, and us jammers wanting to sleep after a long weekend. The goal of the game is to defend your bed from approaching monsters. Monsters will follow tiles that are the same color that they are. If a monster is not able to move forward, it will switch the tile in front of it to its color of choice. The goal of the player is to direct monsters to the turret that matches their color, destroying that monster, for as long as possible. Game ends when all lives are lost. Special thanks to Brandon Lehman for sound!